Our Governing Body are extremely committed to supporting the development and long term improvement of Seymour Park. They work together, with the Headteacher and Heads of school, to help, support and challenge the school. Our Governors believe in the "COMMUNITY" aspect of our school and see this as a huge strength. We will always let you know if we have a governor vacancy. As you know, I am Mr Rae, the Headteacher here at Seymour Park Community Primary School. I have been Headteacher here for over 13 years.This is my 3rd Headship. Some of you remember me from my time at St Alphonsus RC Primary School here in Old Trafford (6 years) and after that I was Headteacher at St Joseph's RC Primary School in Sale. In recent years I have supported other schools, including being Executive Headteacher at Barton Clough Primary School near the Trafford Centre. 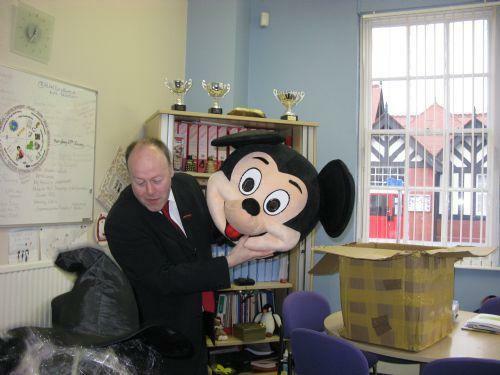 I have worked in many schools around Trafford including Partington Primary School, St Hugh's, St Anne's CE. I have also spent twelve months working in a school in Detroit, Michigan, USA. I am a National Leader of Education (NLE) which means I support other Headteachers and Schools in helping them to be the best they can be. I am also a Pupil Premium Reviewer. I am currently supporting Our Lady of Lourdes Catholic Primary School in Partington so you may not have seen me around as much lately. I am very grateful to Mrs Dickinson and Mrs Tomlinson, our Heads of School, for leading the school so brilliantly when I am away. I am very proud to be a founding member of the Trafford Teaching School Alliance (Seymour Park is a Lead School within TTSA). I have seen huge changes here at Seymour Park over the years and am very proud of the achievements of the staff and children. Our Teaching Staff are the best we have ever had - providing excellent quality learning opportunities for the children. We have been through 2 Outstanding Ofsted inspections during my time here. You can see the Ofsted Reports in the Key Information Section. As Headteacher I am automatically a Governor of the school and I work closely with the Governors to help make sure that our school stays GREAT as well as keep moving it forwards. We should never stop improving. Ours is a 21st Century School! We are lucky to have a group of committed Governors who genuinely care about the school, the children and the community. I try to be approachable and accessible. Please come and talk to me or any of our staff on the playground or in school if you have a concern or want to tell us how happy you are with the school. I am Moataz Alhilou, married with two children that are both lucky to be at Seymour Park. I am a co-opted governor at Seymour Park and part of the Buildings and Finance committee which support the school strategy in relation to budgeting and the school buildings and grounds. I was a Human Resource and Organisation Development Consultant that went back to academia to have a more robust understanding of strategy processes. This is mainly where I will be able to contribute to the governing body. I hold an MSc from Warwick University and a PhD from Alliance Manchester Business School (The University of Manchester) where I am also a visiting professor. I am Mrs Tina Tomlinson, Deputy Head. I am a Teacher Governor. I have been at Seymour Park for 5 years,but I have been teaching for a long time and have a lot of experience. I have 2 children-a daughter and a son -both now attend Secondary School. I feel I have the BIG picture regarding Trafford Education -as a teacher and as a parent. I have worked in Manchester Schools - Crosslee Primary in Blackley, Wilbraham Juniors, Acacias Primary in Burnage and as an Advisory Teacher promoting Primary Science and training teachers. I moved to Trafford and became Deputy Head at St. Joseph's Primary. From there I came to Seymour Park - "the jeweI in the crown of Trafford"
Seymour Park is a forward thinking school with truly dedicated, hard working and caring staff. The staff make learning fun and believe in educating the WHOLE child-helping them develop life skills and skills for learning. Life at Seymour Park is exciting and lively for the children, ranging from hands on practical activites,individual support, small group work,varied opportunities to share learning with others, trips out, visitors, behaviour treats, sports coaches, musicians, special focus weeks......phew! There is sooo much going on. It is a great place to learn and... a great place to work! I try to make myself accessible to parents by being about in the playground to answer any queries or concerns and have an office for more formal discussions. I joined the governing body in March 2015 as I had been working in the Old Trafford community and grew a real fondness for the sense of community and meeting people from all walks of life. I loved the school from my first visit and am immensely proud to play a part in it. I sit on the Buildings and Finance Committee which supports the strategic direction of the school in relation to budgeting and the school buildings and grounds. We want to make sure the school provides the best environment and support for children to learn. Outside of school, I have a wide range of experience, having worked in the charity, housing, local government and private sectors. I'm particularly passionate about social enterprise and am currently trying my hand at running one in Stockport. Hi. My name is Simon Cobb. I have 2 daughters at the school. As an English teacher in Russia, I've taught children aged from 3 to 16 years old. As this was in a commercial setting, I needed to demonstrate the value of my teaching and decision-making to both students and owners. Currently, I work at the BBC in the Children's department where I create digital content (apps, websites and videos) aimed at children aged 2-12 for CBBC and CBeebies. I'm part of the senior team in my department and contribute to strategic and long term planning, as well as reviewing the performance of everything we do. This involves balancing multiple (sometimes conflicting) viewpoints, making sure everyone involved is happy that their needs have been accurately and fairly represented. My specific expertise is in the area of digital and media literacy and the fast changing world of technology and how children can get the most out of it, learning and having fun whilst remaining safe. More generally, I can contribute strategic planning. I know how to create budgets, review contracts and plan successful delivery of projects taking advantage of, or creating, opportunities along the way. I can talk to children, grown-ups, commercial organisations and all sorts of different audiences in a way that they can relate to with a message that is relevant to them. I am Ellen Tickle a local part time teacher and full time mum. I have 6 year old and 3 year old children at Seymour Park Community Primary School. I am an enthusiastic listener and passionate about happy education. I have spent the past 19 years working around the UK and the world delivering outdoor and environmental education. I work in a local Forest School and have set up various clubs and activities to enable students to enjoy the outdoors and understand their human connection with nature and the local community. This includes field trips and community service. In my work I have come to understand the ebb and flow of the school year and the pressure on school leadership teams and teachers to meet the demands of various governments. With this knowledge I hope to represent parents by listening to their hopes for their children's education and encourage the development of this within the school ethos. I hope to encourage involvement in the community so children and families are connected through the school and proud of the local area. I would like to celebrate the rich local diversity by sharing together in festivals throughout the year. I, like all parents want my children to be part of a successful school as a parent governor I hope this is an opportunity to contribute to making this happen. Please feel free to contact me is discuss and governor issues. Hello, I am Rowena Ainscough. I have been a teacher at Seymour Park for over 20 years and I am extremely proud to be a member of the Governing Body of our amazing school. I teach in Key Stage One and have been an Assistant Headteacher for over 13 years. Throughout the years I have developed great relationships with all of our families, often teaching several members of the same family! I love the sense of community at our school and how we share the same vision in order to provide the Seymour Park Experience. As a member of staff I am able to share my knowledge of the school, the policies and present relevant data to the other governors. I am part of the Children and Learning Committee and have a clear understanding of how well the school is performing! I am also a governor at a primary school in Stockport; sitting on both the Finance and Teaching & Learning Committees. This gives me a broad and thorough understanding of the roles and responsibilities of a school governor. I can be found on the playground before and after school each day and I am very happy to meet informally with parents to answer questions and discuss their ideas. I joined Seymour Park Community Primary school in September 2008 and for the past few years have been a proud member of the governing body. I sit on the Children and Learning Committee, and am the online safety governor. I look after all the computers and technology at school and take an active role in the data analysis of the school data. I also run the school football team. I have a passion for computing and technology and love working with the children. I am Mrs Jayne Dickinson, Head of School and I am an Associate Governor. I have been at Seymour Park for 8 years, but have taught at various schools during my career in primary education. I started my teaching journey in Manchester at St Kentigern’s Primary School before working for Manchester LA as an Advisory Teacher responsible for assessment and moderation across a cluster of schools. I moved to Trafford and became Deputy Head at St. Joseph's Primary and from there, was lucky enough to gain the position as Deputy Head at Seymour Park Community Primary School. I truly enjoy working at Seymour Park where no two days are ever the same and consider myself lucky to work alongside a team of dedicated and talented staff. I am married with four children, three of whom attend Seymour Park. I hold a diploma in Fashion and was a pattern cutter for over twenty years. I gave up my career to be a full time mum. Whilst volunteering at Seymour Park, I decided to pursue a diploma in Teaching and Learning at Schools. I am passionate about education. As a parent I have had the most positive experience at Seymour Park. My children have had the privilege of being educated by some of the most amazing, dedicated staff. I would like to give something back to Seymour Park as a parent governor. I have a special interest in SEND and hope to make a positive contribution. I am a mum of two girls both attending Seymour Park. Whilst I only moved into Trafford 13 years ago, my husband actually attended the school nearly 40 years ago. It’s a lovely community school with a strong leadership team. It’s wonderful to see everyone striving together to equip our future generations with respect, tolerance and a high moral compass. I have a Master’s degree in International politics and social policy as well as a teaching qualification. I hope to help the school drive forward to even more success!! I have a passion for education and learning. I qualified as a lecturer after university and my early career saw me move out of the classroom to working behind the scenes with the Local Education Authorities. I’ve worked to secure special needs provisions for children and families and am currently working very closely within the realm of Equality, Diversity and Inclusion. I am also multi-lingual so I hope that all these skills can be utilised fully by the school. I’m extremely excited to have been successful in securing a place on the Board. I hope to work closely with the team at the school and to fully embrace whatever future challenges await. I’m also looking forward to my own future development through this fantastic opportunity.